Authors: Izmaylov S.G., Ryabkov M.G., Leont’ev A.E., Beschastnov V.V., Izmaylov A.G., Lukoyanychev E.E. Aim. To evaluate the clinical effectiveness of the developed adaptive tools for mechanical treatment of wound surface and suturing of relaparotomy wounds. Methods. 55 patients aged 43 to 79 years after relaparotomy operated on for various acute surgical diseases of the abdominal cavity were treated. In the main group (n=22. average age 63.5±4.75 years) in uncomplicated and complicated course of the wound process after relaparotomy for treatment of the wound surface and wound closure, adaptive tools were used as proposed by the authors. 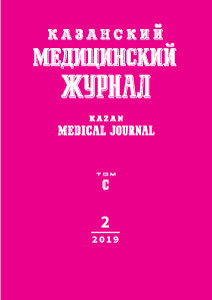 In the comparison group (n=33, average age 62±6 years; p=0.98) traditional mechanical methods of wound defect sanation and wound suturing (simple nodal, 8-shaped and U-shaped sutures) were used. Monitoring of relaparotomy wound healing was performed using an ultrasound method. The analysis of postoperative local complications in the discussed groups of patients was carried out according to Clavien-Dindo classification. Results. In patients of the main group, the multiplicity of wound surface treatment decreased by 1.8 times compared to the comparison group. There were no cases of damage to the underlying tissues of the wound edges. Wound postoperative complications corresponded to severity grade I, II, and IIIa according to Clavien-Dindo classification: in the main group - 27.3% and in the comparison group - 54.5%. Suppuration occurred respectively in 9.1 and 33.3% of patients (p=0.049). Conclusion. The developed adaptive tools are safe and effective mechanical means of prevention of wound postoperative complications after relaparotomy. relaparotomy, adaptive tools, wound contractor, mechanical treatment of wound cavity, suturing of relaparotomy wound, wound postoperative complications. Dindo D., Demartines N., Clavien P.A. Classification of surgical complications: a new proposal with evalu­ation in a cohort of 6336 patients and results of a survey. Ann. Surg. 2004; 240 (2): 205–213. doi: 10.1097/01.sla.0000133083.54934.ae. © 2019 Izmaylov S.G., Ryabkov M.G., Leont’ev A.E., Beschastnov V.V., Izmaylov A.G., Lukoyanychev E.E.